STORMONT is no stranger to crisis, but the decision of the UUP, the SDLP and possibly the Alliance party to reject seats in government presents the toughest test yet for power-sharing. The UUP’s shock announcement that it was to move into the newly created opposition role at Stormont unsettled the DUP and Sinn Féin. Now the SDLP decision to do the same is a seachange for a party whose mission was to deliver power-sharing government as a vehicle for reconciliation between unionists and nationalists. The jury is out on whether jumping ship will boost UUP and SDLP fortunes, but it’s certainly going to stress-test Stormont. Arlene Foster’s DUP and Martin McGuinness’s Sinn Féin must prove they can deliver good government in a way that they have failed to do since 2007. And this time they won't have smaller parties to provide political cover around the executive table. If the Alliance party follows suit and refuses to continue as the agreed candidate for the sensitive justice ministry, then Assembly rules mean the DUP and Sinn Féin have only days to deliver a radical new deal on running that department. Behind a poker face, the two parties are claiming that issue won't be a problem. A carefully stage-managed election campaign returned the DUP and Sinn Féin to power, but now their plans are being put to the test by that ever present worry for politicians – ‘events’. Prior to the May 5 Assembly poll, the DUP delivered a flawlessly engineered rebrand of the party that hung on the appointment of Arlene Foster as leader after Peter Robinson stepped down. The DUP based much of its election campaign on keeping Martin McGuinness out of the First Minister’s role, but now it is going to be more obvious than before that the DUP First Minister and Sinn Féin deputy First Minister are joined at the hip. Meanwhile, Sinn Féin secured incremental growth in February’s Dáil election, but lost a seat in the subsequent Assembly poll and saw left-wing rivals elected in Foyle and West Belfast. So the latest developments at Stormont come as the republican party is under considerable pressure to prove it can deliver for an increasingly disenchanted nationalist electorate. Critics say the notion of an 'opposition' in a regional assembly that has yet to prove it can do government, is a bit grandiose. But the smaller parties believe they can create a new dynamic. What is certain is that with a stand alone DUP/Sinn Féin administration, we will see more clearly than ever whether the leaders of unionism and nationalism can work to the mutual benefit of their communities. 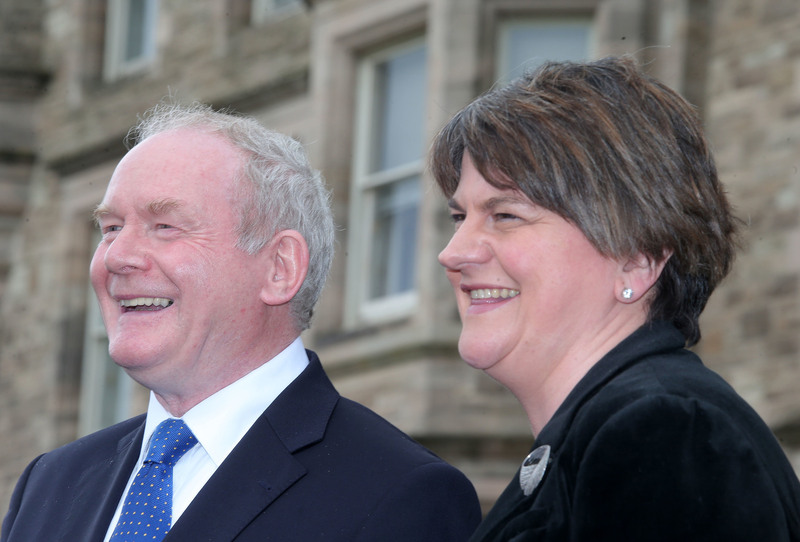 The united-front shown before the cameras by Foster and McGuinness suggests that either they're putting on a brave face, or that they'll try to steamroll their opponents by delivering a real partnership government. That would represent a major breakthrough, but it won't be easy. Can they handle Tory cuts, tackle inequality and poverty, legislate on abortion, answer calls for marriage equality, fix health and education, meet housing need, agree deals on the legacy of the Troubles, on disbanding paramilitaries and on cultural clashes over parades and the Irish language? After years of deadlock, the power-sharing experiment is facing its toughest test, or perhaps a new opportunity to prove its worth. If there is further failure in government, it should at least be easier to know who is to blame. In Stormont terms, that alone would represent progress.